Kinkakuji and Ginkakuji are the two most famous destinations of everybody travelling to Kyoto. Their names have similarities as they differ only in the first letters. The original names of both the temples are not these. The beautiful golden coloured unbelievable scenery provided by the Kinkakuji and the Japanese outlook of the Ginkakuji are entirely different in aspects. ‘Kin’ in Japanese means ‘gold’. As the name says, Kinkakuji is the temple of Golden Pavilion. It’s original name is Rokuonji temple (deer garden temple). It is a Zen Buddhist temple situated in Kyoto which is believed to have relic’s of Lord Buddha inside it. It as registered as a World cultural Heritage Site in 1994. As we cross the entrance gate named Kuromon(Black gate), we will be entering into the beautiful holy yard of the Rokuonji temple. There is a long pathway with greenery at its both sides, which leads to the main entrance of the temple. Crossing the Somon(main gate), is the place where we can buy the entry tickets. Taking the entry tickets, we will get a pamphlet which has a brief description on the history and structure of the entire temple premises and buildings. The ticket costs only 400 yen for the adults along with a Japanese talisman. On the way, there is a Shourou (bell tower). There are some buildings at the other side of the way, which are the priest’s quarters, abbots chamber etc. The beautiful sight of the golden pavilion at the middle of the pond filled with rocks and garden around it is really unbelievable for our eyes. The scenery created by the Japanese style garden surrounding the area with the reflection of the pavilion in the water make us think that we are in some imaginary world of a fairy tales. This place will always be really crowded with visitors. The view of the pavilion building is splendid from every corner. We could only enjoy the beauty from the banks of the pond, as the entry to this temple is restricted for the public. The Kyouko-chi (mirror pond) surrounded with trees and plants with the golden temple at its middle really seems to be proud about itself as it reflects the beautiful surroundings and the golden pavilion very clearly like a mirror. There are a lot of Koi fishes of various colours swimming around in the pond. Inside the pond, many small islets are also present with small plants and rocks. Ashihara Island is the largest among these islets which have some small pine trees in it. There are three levels for the pavilion in which the uppermost two tiers are covered with golden foils. The lowermost one seems to be made of wood with wooden pillars and white coloured walls. We can see a golden statue of a Phoenix bird with its open wings at the topmost point of the pavilion. The pamphlet says that the first level of the pavilion is built in Shinden style of 11th century imperial aristocracy, the second level is built as per buke style of warrior aristocracy and the uppermost is made in Chinese Zenshu butsuden style. And it represents Muromachi period architecture in its whole appearance. The stone pavements and steps leading us to the next part of the temple area gives plenty of attractions to our eyes. There is a small waterfall named Ryuomon Baku(Dragon Gate Waterfall ). We could also see a stone named as Rigyou seki(Carp stone) beneath the fall. On the way, at one end we could see some statues with a metal bowl in front of it. People used to throw coins over there, and it is believed to bring good luck and fortune if the coin fell inside the bowl. This area could be seen filled with coins all around the statues as all are trying with great effort to put their coins inside of the bowl. The path leads us to a tea house named Sekka-tei Tea house, and it is said to provide the beautiful views of the Kinkakuji in the evenings. There are open style tea stalls, souvenir shops etc. Along the sides of the way that end at a small temple area. Here we could see people praying, ringing the bells and burning incense sticks.The temple has the stone state of the Buddist deity Fudo-myo-o’s inside it. This statue is believed to possess miraculous powers and is hidden from the public. Even though the name of this temple seems similar to the Kinkakuji, the appearance and outlook of this temple and surroundings are a little different. The style of the temple is similar to the Kinkakuji. ‘Gin’ means ‘silver’. But as its name indicates the pavilion here is not silver covered. History says that it was decided to cover the pavilion with silver, but due to the war that happened during the times, lead in halting the construction of this temple. As a result, until now it is left uncovered with silver. This Zen Buddhist temple is located in the Higashiyama district of Kyoto and it is built in 1474. The original name of this temple is Jishouji temple. The main and only building of this place is the Kannon hall which is known as the Ginkaku. There is a pond in front of the pavilion that reflects the Ginkaku as well the beautiful Japanese garden surrounding it. The thick dark woods with moss covered ground at its shadows are really beautiful. 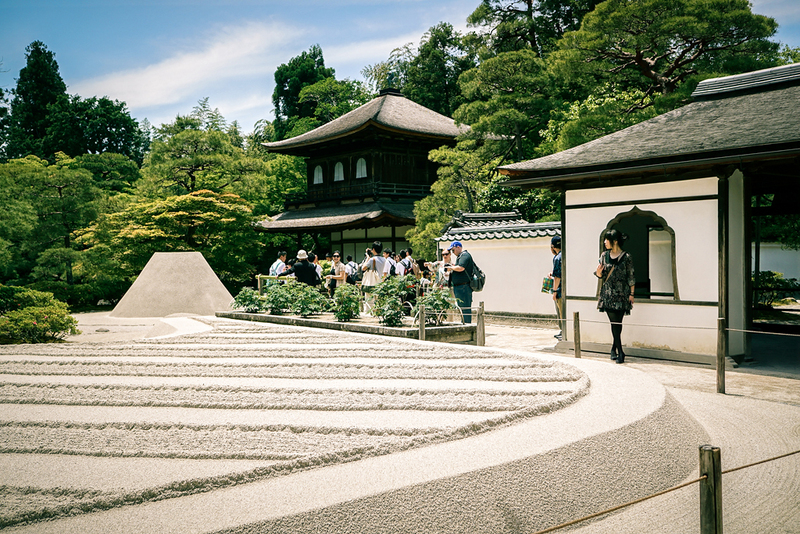 We could see small sand made as a representation of the Mount Fuji near to the pavilion.